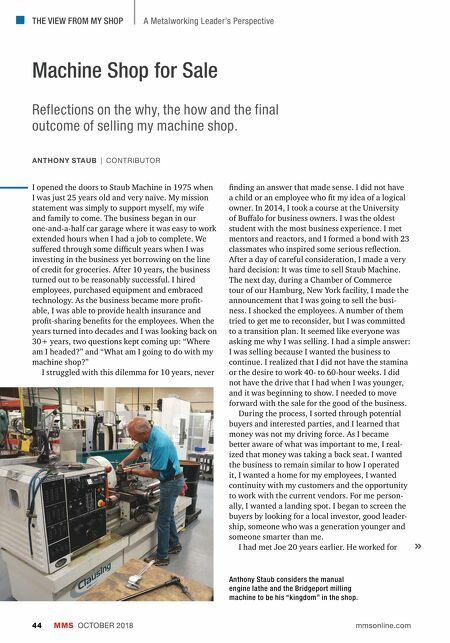 THE VIEW FROM MY SHOP MMS OCTOBER 2018 44 mmsonline.com A Metalworking Leader's Perspective Machine Shop for Sale Reflections on the why, the how and the final outcome of selling my machine shop. ANTHONY STAUB | CONTRIBUTOR I opened the doors to Staub Machine in 1975 when I was just 25 years old and very naïve. My mission statement was simply to support myself, my wife and family to come. The business began in our one-and-a-half car garage where it was easy to work extended hours when I had a job to complete. We su€ered through some di‚cult years when I was investing in the business yet borrowing on the line of credit for groceries. After 10 years, the business turned out to be reasonably successful. I hired employees, purchased equipment and embraced technology. As the business became more profit- able, I was able to provide health insurance and profit-sharing benefits for the employees. When the years turned into decades and I was looking back on 30+ years, two questions kept coming up: "Where am I headed?" 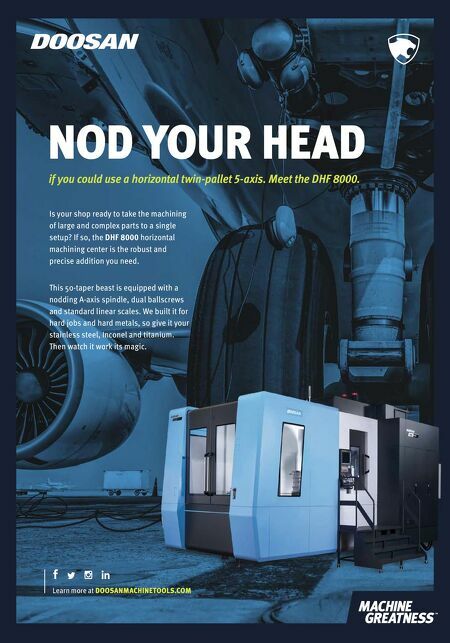 and "What am I going to do with my machine shop?" I struggled with this dilemma for 10 years, never finding an answer that made sense. I did not have a child or an employee who fit my idea of a logical owner. In 2014, I took a course at the University of Bu€alo for business owners. I was the oldest student with the most business experience. I met mentors and reactors, and I formed a bond with 23 classmates who inspired some serious reflection. After a day of careful consideration, I made a very hard decision: It was time to sell Staub Machine. The next day, during a Chamber of Commerce tour of our Hamburg, New York facility, I made the announcement that I was going to sell the busi- ness. I shocked the employees. A number of them tried to get me to reconsider, but I was committed to a transition plan. It seemed like everyone was asking me why I was selling. I had a simple answer: I was selling because I wanted the business to continue. I realized that I did not have the stamina or the desire to work 40- to 60-hour weeks. I did not have the drive that I had when I was younger, and it was beginning to show. I needed to move forward with the sale for the good of the business. During the process, I sorted through potential buyers and interested parties, and I learned that money was not my driving force. As I became better aware of what was important to me, I real- ized that money was taking a back seat. I wanted the business to remain similar to how I operated it, I wanted a home for my employees, I wanted continuity with my customers and the opportunity to work with the current vendors. For me person- ally, I wanted a landing spot. I began to screen the buyers by looking for a local investor, good leader- ship, someone who was a generation younger and someone smarter than me. I had met Joe 20 years earlier. He worked for Anthony Staub considers the manual engine lathe and the Bridgeport milling machine to be his "kingdom" in the shop.